Revealed on StarWars.com yesterday, these new designs from Jorge Molina will appear in the newest arc of the Star Wars ongoing series from Marvel. Molina will be taking over from incumbent artist Leinil Francis Yu and joining writer Jason Aaron from Star Wars #21, beginning with an arc called “The Last Flight of Harbinger” starring this elite squadron of Stormtroopers. And hoo boy, they’re not your average Stormtrooper. In the interview Aaron discusses how the comic will tackle engaging in the Imperial perspective, examining the history of these troopers and how they came to choose the Empire over the Rebellion, which is all very fascinating. But just look at these crazy designs. They honestly look like they’re out of a video game or something, weird new enemy types cooked up because shooting or lightsabering the same normal stormtrooper all the time would get a bit boring. But as I mentioned earlier, these guys do a fabulous job of balancing that Star Wars quality of cool and camp. 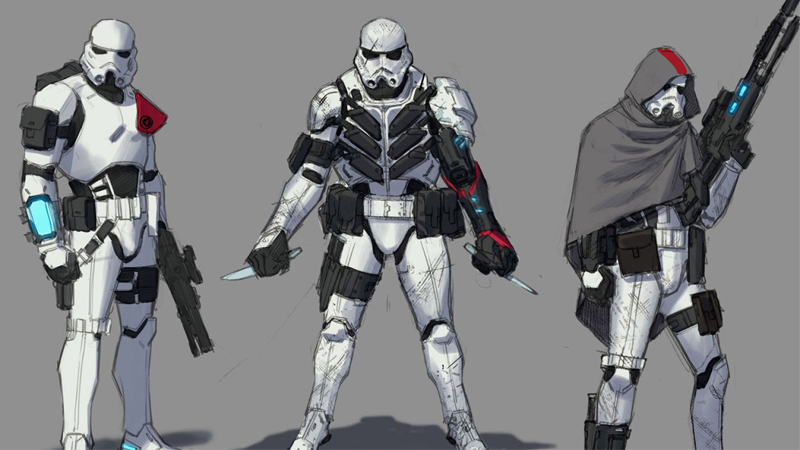 That Stormtrooper sniper with his poncho is cliché as hell, but he looks rad. And yet, he’s also standing next to a Stormtrooper with a robot arm AND A CHEST FULL OF KNIFE HOLDERS TO HOLD HIS MANY KNIVES. They look like something out of Mass Effect, crossed with the familiar design aesthetic of the classic stormtrooper—this really weird blend of Star Wars and something that is very much not Star Wars. And yet it somehow works! It’s incredibly silly, but in a fun way. I can’t wait to see these over-gadgeted Stormtroopers in action. Star Wars #21 and its cavalcade of weird Stormtroopers will be available in July.